Almost 1,700 students live on campus at UBC Okanagan. We try to place students in rooms based on all the information provided during the application process. This includes whether you’re eligible for a guaranteed room, roommate group requests, residence or room type preferences and lifestyle habits. We can’t guarantee all preferences will be accommodated. June—applicants receive and accept offers to live in residence. 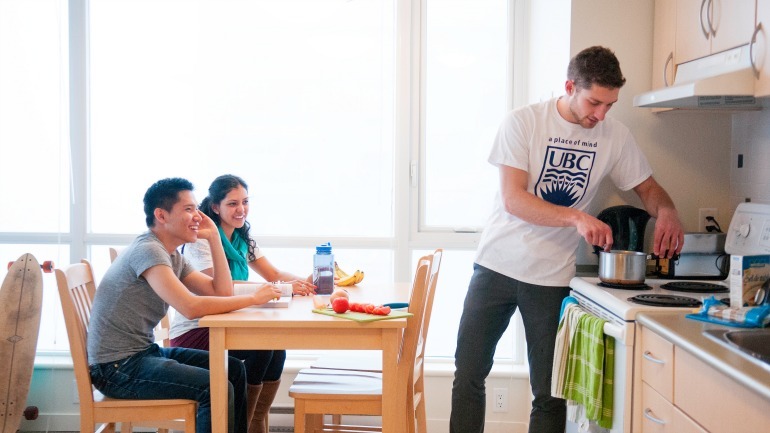 July—Student Housing & Hospitality Services works behind-the-scenes to assign each student to a residence and room, based on preferences listed on the application form and grouping together students who applied to live in Integrated Learning Communities. We do our best to accommodate these preferences—lifestyle habits, roommates, etc.—but can’t make guarantees. August—students receive specific room assignment details. February— students receive and accept offers to live in residence. Students who don’t receive an offer are added to a waitlist. March/April— students go online to update preferences (residence area, room type, Integrated Living Community) and request roommates. After May 1, Student Housing & Hospitality Services arranges residence assignments. June—students receive residence area assignments. August—students receive detailed room assignments.